Cut to Fit Window Privacy Film from Collections Etc. $12.99 $8.97 Save up to 31% Now! Enjoy complete privacy while letting the sun shine in. 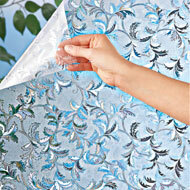 Floral pattern static cling film goes up & peels off window glass quickly, easily and without messy adhesives. Comes on a roll and cuts with scissors for a custom fit. Removable and easy to reposition. Plastic. 78"L x 17"W.
Great use for front and back door if you have small windows. Gives a little privacy, with still letting the light in. Easy to cut to size and easy to install. - Simply Jans, Boston Ma. Yes I would reorder this window cling. It's window film what's to rave about? - jack, Gilbert SC.